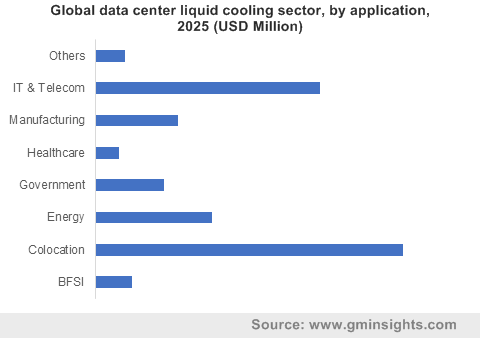 Data Center Liquid Cooling Market size valued at over USD 750 million in 2018 and will grow at a CAGR of 21.5% from 2019 to 2025. High reliability and efficient cooling benefits of data center liquid cooling market products are mainly driving their use in several applications including BFSI, colocation, manufacturing, etc. Several operators across the globe are facing challenges in maintaining appropriate temperatures in their facilities. Excessive heating of components can impact the operational performance and component lifespan, which has resulted in the deployment of several cooling solutions. To address heat management requirements in complex infrastructures due to the integration of several high-capacity components, solid-state drives, etc., innovative water-based coolers are used. These factors along with the capabilities to maintain machine learning & AI-based implementations in new facilities are creating several chances for the data center liquid cooling market growth. High-power AI components including accelerators and servers have high data capabilities and increase the network heat, further increasing the requirement for efficient cooling solutions. A major factor challenging the data center liquid cooling market development is the complexity of switching from traditional cooling systems to new liquid-based systems. High initial investments are required in the transformation, which is not a feasible option for very small and old infrastructures. However, network & component upgrades and low energy consumption benefits are expected to overcome the present barriers in the industry. Another factor limiting their adoption is a high chance of corrosion. Liquid coolers pass through pipes in the complex networks and cause corrosion in very less time. To overcome this challenge, manufacturers are improving the quality of pipes and eliminating leak risk. 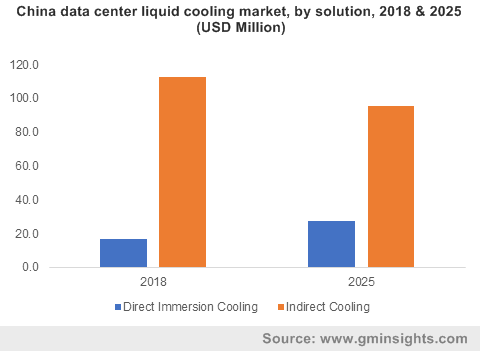 In the data center liquid cooling market, the service segment is experiencing growth at a CAGR of over 22.5% owing to the requirement of continuously monitoring & managing cooling systems in large facilities. Service providers and manufacturers are providing timely and efficient maintenance & support services through trained resources. Also, several companies offer consultation services that include guidance to deploy appropriate products depending on data center components. Companies avail these services to deploy efficient products and maintain the performance with the lowest possible investments. Due to extremely high storage densities, the heat increases, and temperature fluctuates, resulting in damaged cooling systems. To avoid and overcome such issues, companies utilize timely maintenance services offered by manufacturers, further boosting the market. Small & medium-sized data center liquid cooling market have witnessed the increased adoption, which is expected to exceed USD 750 million by 2025 due to the growing density and data capabilities in various industries such as healthcare, manufacturing, and education. Due to digitized operations, data centers are becoming complex with a requirement to reduce heat at regular time intervals. Water-based coolers can fulfill the demand in small & medium sized facilities and aid operators through efficient operation management. Growing heat & temperature changes reduce productivity and increase power consumption. This needs to be eliminated. In such cases, the liquid coolers solve these issues further developing the market. The BFSI segment in the data center liquid cooling market will witness adoption due to high workloads and digital documentation in financial & banking institutions. It also includes high-frequency blockchain applications and trading systems such as cryptocurrencies and intelligent contracts. These systems include huge amounts of data and require efficient storage & management capabilities that support the use of data center facilities. In order to manage heat & temperature levels in these facilities, providers are moving towards liquid cooling options due to the efficient performance benefits that further fuel the industry growth. North America is rapidly developing in the data center liquid cooling market owing to the presence of several complex facilities in the U.S. Heavy utilization of digitized technologies in the country and the need to manage the huge data capabilities support the industry expansion. Moreover, major industries including manufacturing, healthcare, colocation, IT & telecom, etc. are rapidly moving toward digitized operations. The presence of several data center & related component providers in the U.S. is a major driver for the regional growth. Prominent companies in the market include Mitsubishi Electric Corporation, Vertiv Co., Rittal GmbH & Co. Kg., Alfa Laval, Schneider Electric, CoolIT Systems Inc., Chilldyne Inc., etc. These players are working on product innovations with the help of R&D activities. They also adopt various strategies such as strategic alliances, mergers, and acquisitions, which strengthen the company’s industry position. For instance, in November 2018, CoolIT Systems announced its collaboration with other industry players to support & facilitate advanced research through increased performance computing. 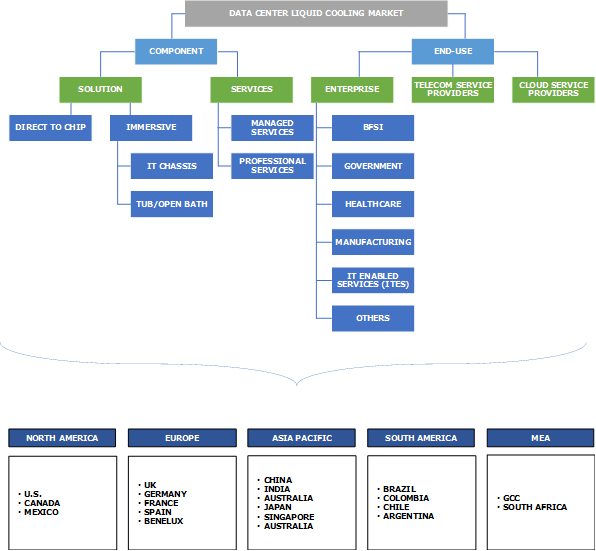 The data center liquid cooling market comprises few players across the globe that have continuous solution innovations. Companies develop partnerships and collaborations with other value chain members & manufacturers and provide application-specific products. The customers demand highly efficient solutions to reduce energy & power consumption in complex data centers, which propels the industry size. Heavy utilization of liquid solutions is attributed to the low power consumption benefits over air-based products. Water-based solutions have more heat removal capabilities & reduce the power consumption by 70%. Moreover, the need to reduce electricity consumption in data centers and improvise energy efficiency is majorly driving the industry. Owing to less energy consumption, these products facilitate easy deployment at edge sites and high-capacity power locations. The increasing establishment of colocation facilities across the globe and growth in the data handling requirements accounts for the consumption of these solutions in huge numbers.